One of the revelations of this winter has been the form of Georgia Taylor-Brown. The 19-year-old finished fourth in the Euro Cross and recorded a stunning debut over 10km with 33:34 at Ribble Valley, which placed her seventh on the UK all-time junior list. Taylor-Brown has already garnered a reputation as a redoubtable championship performer. She is also the reigning double ITU (International Triathlon Union) European junior champion. Athletics talent is certainly present in this young athlete’s genes. Her parents are Darryl Taylor, who ran 1:47 for 800m as a junior and was a sub-four-minute miler, and Beverly Brown, who was a county-standard middle-distance athlete in the Eighties. Taylor-Brown began her sporting life in the pool, aged just five, when she quickly progressed to being a county-standard swimmer. Aged 13 she started her athletics journey, encouraged by PE teacher Julia Dolan at Fairfield High. In her first major race, with very little running training behind her, she finished fourth in the county schools cross country. “I only ran once a week, as I had plenty of endurance through swimming,” she said. “However, I used to swim on a Tuesday after school, then go straight to training at East Cheshire Harriers, which was quite a strain. They attended a British Triathlon trial day in Loughborough. Candidates were assessed on a timed run and swim. Based on some impressive results she was accepted on to the junior development squad, which meant a free bike and access to group training camps four times a year. She recalls that her early bike sessions were terrible. She often would become dropped and had to be picked up by the “relief van” which followed the riders during the gruelling four-hour group rides. Junior triathletes in races have to swim 750m, cycle 20km and run 5km and she determinedly worked on her cycling. In the meantime, her cross country improved with a win in the 2010 Northern Championships at under-17 level and England schools selection. She also competed on the track, running an impressive 9:52 for 3000m, which is still a PB. The link with former GB cross-country international Paul Roden, and his young distance group at Sale, came the following year. The group includes fellow 2013 European Cross representative Charlie Hulson. Success followed in the same year with some strong performances, including silver in the Northern Cross Country Championships, and sixth in the English National. In early 2012, despite pressure with A-levels, which meant missing some training, she finished third in the Northern Championships in Pontefract. This vein of form continued in June with a high-calibre triathlon win in Alanya, Turkey. In September Taylor- Brown joined the British Triathlon elite squad at Leeds University where she studies sport science. The squad do much of their swimming and cycling sessions together. They also have access to winter training camps in places such as Aguilas in Southern Spain, to where the Sale Harrier headed in the second week of January. Being part of an elite triathlon squad, including the Brownlee brothers and world champion Non Stanford, who is a 32:39 10km runner, is clearly a significant factor in her recent development. The Sale Harrier went on to complete her full set of Northern medals, comfortably beating the field at a snowy Knowsley Park in January 2013. This was despite having returned from a triathlon event in Sydney four days earlier. Further improvement followed with qualification for the World Cross, finishing fourth in the Inter-Counties. An excellent 17th, just one place behind Emelia Gorecka, was a key factor in the team winning a superb bronze medal in Bydgoszcz. April saw a successful defence of her European triathlon crown in Eilat, Israel. She added more silverware to the cabinet in September when she was second in the ITU World Triathlon Series in London despite having missed a significant amount of running through injury. 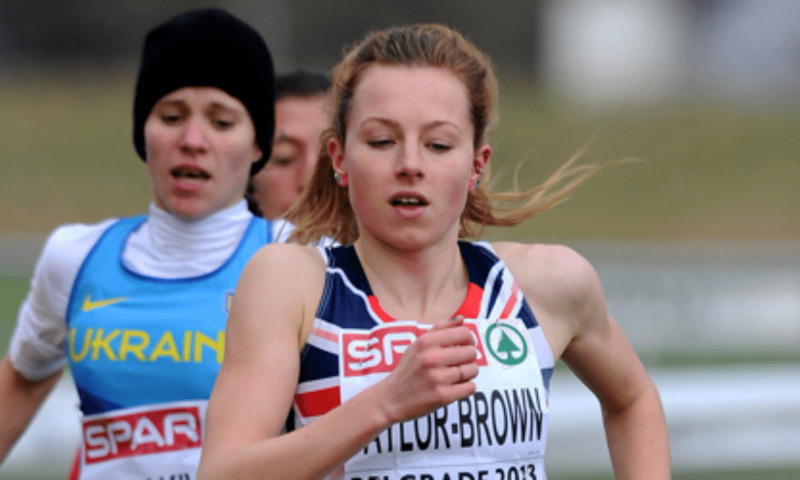 Taylor-Brown shares a house in Leeds with Olympic 1500m finalist and fellow Euro Cross representative Laura Weightman. Although good friends, the two do not train together often, Taylor-Brown citing Laura’s pace as being a “little too quick for me”. After qualifying comfortably for Belgrade behind Gorecka, there came an early test of character, when her shoe came off early in the race. “I suppose it was lucky that it was me who lost a shoe, as I’m used to the transition following the cycle part of the triathlon,” she said. “I didn’t really panic, I just put it back on, and worked through the field, keeping my eyes on the front of the race. Both coach and athlete were pleasantly surprised with her time on an undulating course, running almost even 5km splits. The time is fairly close to what some of the world’s best return at the end of their triathlon. Taylor-Brown’s success has led to her recently joining the ASICS UK team for 2014 and she is at the vanguard of a new breed of athlete, combining running successfully with other sports. The Brownlees and Stanford are high-profile examples of this trend, while Gordon Benson is a leading junior cross-country runner and triathlete. Taylor-Brown got her year off to a winning start with victory at the BUCS Cross Country Championships where she beat the likes of European junior cross country champion Emelia Gorecka to finish two seconds clear. She says that she is grateful for the support of ASICS, who provide kit, bike supplier Eureka Cycles, and the support of the National Lottery. So what is next for the multi-talented Mancunian? Another 10km this year is a target, maybe the Trafford 10km in March, with the Saucony National Cross Country Championships also on the radar. In the spring and late summer she has the European and World triathlon events. The Commonwealth Games in Glasgow may be an “outside” possibility and the Rio Olympics in 2016 is a realistic target. She will still be only 26 by the time of the 2020 Games – and possibly at the peak of her career by then. You can find further performance stats on Georgia on Power of 10 here.